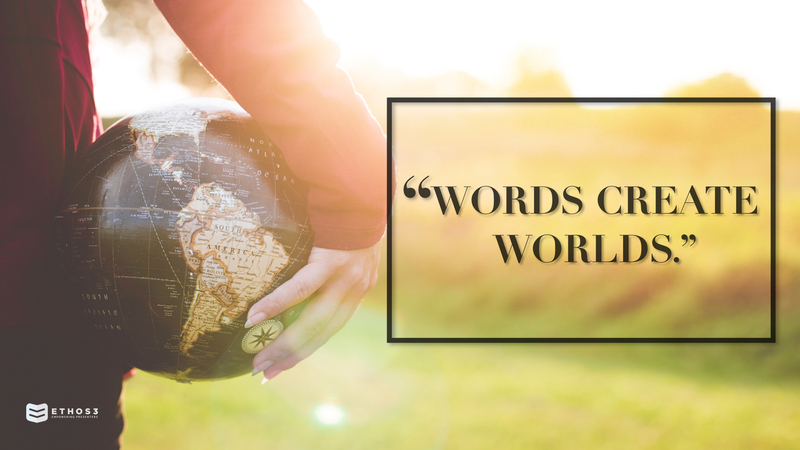 Home / "Words Create Worlds"
From the panorama of the world stage to smaller, more personal venues, it is true: “Words create worlds.” The words we speak and write hold within themselves a tremendous power and tenacity for good or evil. They can exclude or embrace, heal or humiliate, lift up or tear down. How many of us have internalized self-hatred that resulted from repeated criticisms from a person we love? How many can still remember a compliment made by a teacher, even though it was decades in the past? Words can shape and form, and they can break down and destroy. What James is advocating is a life of consistency. He’s telling his listeners that he believes it is important that they conduct themselves in steadfastly Christian ways in a difficult and deceptive world. Our words and our actions are to be absolutely in line with what we believe. In other words, “walk the talk”. If you say you believe the Good News of God—speak it, and live it. If you say you believe the Gospel, but your words are filled with anger, judgement and hatred, you make a mockery of the faith you profess. That’s heavy stuff. It should make us slower to speak, and kinder in tone. Words can alter our moods, change our way of thinking, and ultimately affect how we act. The Book of Proverbs includes several verses about the contrast between the speech of the wise and that of the unwise. Here are a few of them: “The mouth of the righteous is a fountain of life, but the mouth of the wicked conceals violence.” (Prove 10:11); and “The heart of the righteous weighs its answers, but the mouth of the wicked gushes evil.” (Prov 15:28). This talk about the importance of words is critical in the era in which we live. Words come at us from all directions: from the pulpit, from people we love, television, the internet and printed material. One of the cautions that we’re faced with is to choose carefully not only the words we speak, but also the words to which we listen and from which we derive our greatest truths. Is the person speaking them trustworthy? Does that individual, in fact, have our best intentions at heart? Or are they speaking from a darker, more manipulative place? Are they seeking to build up or tear down? Do their words ring true, or are they raising caution flags? So many words, and so many voices speaking. In the end, our greatest hope is to listen carefully to that one voice that cannot fail us. And that voice comes from our Savior, Jesus. The Gospel of John begins: “In the beginning was the Word, and the Word was with God and the Word was God.” One of the names by which our Savior is known is the Logos. The Word of God. The life-giving and redemptive word of Truth. By listening to our Savior, by speaking words of grace and hope and by living a life that models these same words, we can become co-creators with the Divine, helping to make a world which truly embodies the Kingdom of God. In Jesus’ name. Amen.